Dexster is a perfect audio editor tool for your audio production that supports many popular audio formats and features audio CD burning. 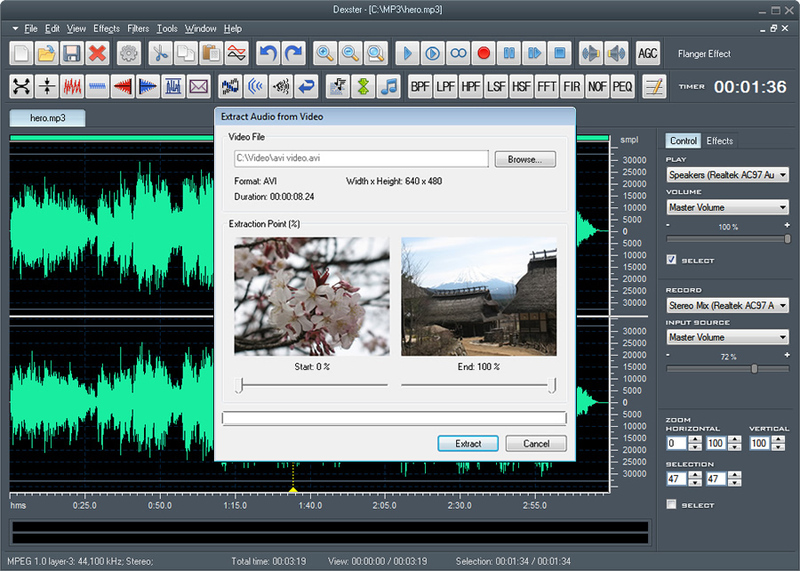 Dexster audio editor provides cool and easy-to-use interface that allow you to edit an audio file visually (Cut, Copy, Delete Select, Delete Silence, Paste, Paste From File, Mix, Mix From File). Supports multiple files editing at the same time and Keyboard Shortcut Commands. You can insert and change described information about marker / audio file. The software allows to apply different effects (Amplify, Compressor, Delay, Envelope, Equalizer, Expander, Fade, Flanger, Invert, Normalize, Phaser, Reverb, Reverse, Silence, Stretch, Trim, Vibrato, Chorus, Pitch Shift, Distortion). Also it can apply Virtual Studio Technology (VST) effects and preview effects before apply. Audio Editor has the Audio Player which can play an audio file or any part of it. Convert an audio file from one format to another. Batch audio conversion is also supported. Supported Operating Systems: Windows 2000, XP, Server 2003, Vista, Server 2008, Windows 7, Windows 8/8.1, 10.